Check Rates & Availability at BEST WESTERN Butch Cassidy Inn! 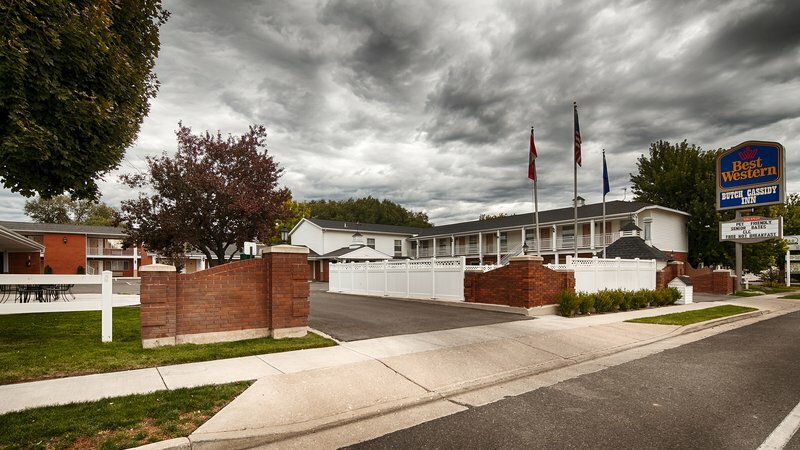 Stay at this Beaver, Utah hotel for a warm and friendly home-style atmosphere while traveling in Southern Utah. Ideally located near tourist attractions, the Best Western Butch Cassidy Inn provides clean and comfortable accommodations for travelers to the area. This Beaver, Utah hotel is located just two miles off I-15 on the I-15 business loop. Hotel guests will be close to Bryce Canyon National Park and Cedar Breaks National Monument. Other nearby attractions include Cove Fort Museum, golf course, fishing and hunting. Easy access to the famous Paiute ATV Trail. Each room is individually decorated in American Traditional style, fully equipped with complimentary high-speed Internet access, cable television with over 30 channels, coffee/tea maker and iron/ironing board. Pets are welcome for a small fee. Every morning, guests to this Southern Utah hotel are greeted with a complimentary full breakfast. After a busy day, visitors can relax at the hotel's seasonal outdoor pool. Come experience the hospitality and professional service at the Best Western Butch Cassidy Inn in Beaver, Utah. Enjoy your stay! Management reserves the right to refuse to provide accommodation to persons less than 21 years of age unless accompanied by a parent. Identification is required at check-in. From: I-15 North bound. Take Beaver Exit 109 turn right onto Business Loop, go two miles to city center. Best Western Butch Cassidy Inn is on the right, 103 miles north of St. George, UT. From: I-15 South bound. Take Beaver Exit 112 turn left onto I-15 Business Loop, go two miles to city center. Best Western Butch Cassidy Inn is on the left, 200 miles south of Salt Lake City, UT. From: Interstate 70 West. Take Interstate 15 South to Beaver, 22 miles, take Exit 112 turn left onto I-15 Business Loop, go two miles to city center. Best Western Butch Cassidy Inn is on the left. 2.00 mile(s) from Sportsman's Paradise Steak House, steak, shrimp, chicken, pork ribs. Meals include complimentary shrimp bowl and scones, 399 North Highway 153. 1.50 mile(s) from Maria's Mexican Cocina, homestyle Mexican food with a fresh taste. 2.00 mile(s) from Kan Kun Mexican Restaurant, authentic Mexican food. 1474 South 450 West. 0.10 mile(s) from El Bambi Caf , Best homestyle cooking in town, fresh baked bread and more. 2.00 mile(s) from Hunan Garden Chinese Restaurant, lunch specials. 1425 North 400 West.